And a hot and voiceless Gareth trying to stop the chickens from pecking last years blown eggs carefully stored in a box of saw dust! Hopefully the next 24 hours in the Baynham family will wave Bye-Bye pharyngitis and Hello Easter Bunny! I met my husband in 1994 when I was relatively young. I was a twenty year old student nurse on holidays in Greece with a group of friends. I was just spreading my wings and finding my feet as my own person having spent the first 18 years of my life growing up in my family home under the fairly strict and safe boundaries of my parents. I wasn't looking for a boyfriend, never mind a husband. Despite this I took a liking to the funny Welsh guy I met while following friends from bar to bar, I just didn't dream to imagine he might still be in my life 18 years later. In fact when he asked if he could see me again I set him a challenge. I told him I would only invite him to my Nurses Ball in three months time if he sent me a card for my 21st birthday. The challenge was that I knew he only arrived home to the UK the day before my 21st, not enough time to buy, post and have a card delivered internationally. The day of my birthday arrived and I celebrated it with a small group of friends and family including some American relatives who were passing through Dublin while on an Irish holiday. There was no card. I felt a little crestfallen. This was before the days of emails or texts. Once the postman had done his delivery and no UK postmarked card was on the door mat I realised that my silly challenge had backfired on me. The evening passed by and there was a knock on the door. Trina our neighbour called in to wish me happy birthday. Her face was full of excitement as she passed a beautiful floral arrangement to me. She explained that Interflora had tried to deliver it that morning and when no-one was home they had left it with her. She had been out all afternoon and had only just returned. The flowers were from Byron. I can't remember exactly what the card attached said but it was something to the effect of "Will this card do?" He flew over to spend the weekend of the Nurses Ball with me. Having met abroad in the August Byron flew over to see me about once every 4-6 weeks for fleeting weekend visits, usually landing in Dublin on a Friday evening and returning again on the Sunday. Between visits we wrote letters and built up expensive phone bills. 8 months down the track it was Easter 1995. Byron booked a flight to land on Good Friday evening. It would be the 6th time we met and the last visit before I had to really knuckle down and study for my final exams if I wanted to qualify as a nurse. We knew there would not be another visit until the exams were over a couple of months later. A few hours after he had landed I found myself being proposed to. I think I said yes before he finished his sentence. We had no ring and decided to wait to buy the it on his next visit. It didn't stop us telling everyone our news. I know many people buy the ring together and then wait for the perfect time for the proposal and making their news public. I was probably quite young and naive telling the world I was going to marry this man who I had met 6 times and without even so much a ring on my finger but I was young and happy and very, very excited! I remember being called to the Matrons office. Back then the Matron was always a nun, one of the Sisters of Charity who had set up the hospital and run it since 1834. I had no idea that it was an expected formality that all students had to tell Matron their news in much the same way as we would be expected to tell our parents. I felt a bit awkward standing there flushed faced in her office in my white student uniform, white polished shoes and starched nurses cap. I explained that the ring would be on my finger on the weekend after the end of exams. I remember Matron giving me a very genuine smile as she wished me well. There were many furtive glances as I changed in the communal dressings over the following weeks. I believe many people were expecting to see signs of a baby bump to explain such a quick engagement to someone I had known for such a short amount of time. And so today it is Good Friday. This week is an important one in my churches calendar. We will all commemorate the death of Jesus and his resurrection and beginning of new life. Today in my heart there is a little flutter because for me today marks 18 years since the beginning of my new life too. The life that I share with Byron all because of a simple question and an even simpler answer. Memories that came flooding back this week when an American/Irish distant cousin sent me a Facebook friend request. 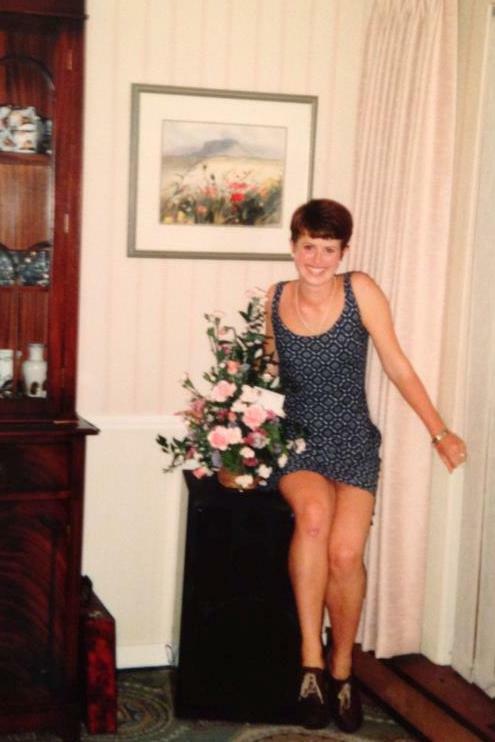 A girl I last saw on my 21st birthday when she snapped a photo of me with a flower arrangement grinning with the excitement and possibilities of youth. A photo that she put up on her Facebook page with a witty comment about how she thinks they may have been from a great guy I had met on holiday... a guy that she could see all over my Facebook page today. Thank you Andrea, you have triggered some very happy memories! Not really enough to feed a family of five. I guess it's time for a trip to the local supermarket...! Sometimes the kids need a helping hand with home-work. If it's maths go ask Dad. Biology ask mum. Food Tech... DEFINITELY ask mum! One of the recent homework help requests I had was when one of the girls had to find a product in the supermarket with "New" on is label and then do a presentation to their class trying to promote the product to their classmates. They were allowed to hand around small tasters as part of their presentation. The chosen product was a Woopie Pie packet mix. I loved hovering around in the background as my kitchen was taken over and I offered help licking spoons, a total role reversal from normality! When the whoopie pies were cooked and cooled the filling was piped on top and then a second pie sandwiched it all together. I was very lucky that the mix stretched to two more pies than were needed for the class and teacher. Because I was such a good mum and I helped with the tidying up I was given one as a treat with a cuppa. Bliss! What's the next Food Tech presentation? I love this kind of homework, bring it on! Happy St Patrick's Day 2013! This St Patrick's Day we had the pleasure of sharing our celebrations with two new additions to our family, Nanako and Izumi from Japan! We woke them on their first morning of their Australian home-stay to green pancakes and diddly-dieddly music coming from the kitchen. We gave them green T-shirts and toasted their temporary new nationality. After blowing up some tri-colour balloons we decorated the car with bunting from our parcel from Dublin and away we went to the Hunter Valley and Harrigan's pub for lunch. We met up with friends and there was many a "Slainte" as pints of Guinness were raised. ...before some unknown person took my camera and proceeded to take "selfies" with it! As always, a great day and lots of memories. A good celebration is nothing without great friends to share it with. And on this St Patrick's day there sure was friendship and craic go leoir! It's the night before St Patrick's Day and I am loving the preparations! My Irish Rugby shirt has been ironed and I have done five sets of sparkly green manicures, including myself. Hold me back. Tomorrow is going to be fantastic. We have a group booking in a wonderful Irish Pub in the Hunter Valley. The weather is due to be sunny but not overly hot. I foresee a day of "Be Gosh and Be Gora" and a few "T' be sure, T' be sure's"
I'll be raising a glass to you, my Irish and my Wanna-be-Irish friends alike! Happy Birthday my gorgeous Sian. I cannot believe you are 15 years old already. I feel old! I hope you enjoyed your birthday celebrations. I'm sure if I had asked the waiter in Max Brenner chocolate shop if I was allowed to light candles in their double choc fudge brownie sundae I would have been told "No" That's probably why I didn't ask and just did it really quick and we all sang "Happy Birthday" as quick and softly as we could so you could blow them out before we were kicked out! It was only after the smoke had cleared I noticed the sprinklers in the ceiling, directly above my head! Now that would have been a birthday to remember!!! Enjoy this year my beautiful girl. These years just seem to be slipping away faster than I can catch them. There are many, many exciting firsts to come as you make your way through these last few years of High School. Enjoy them. Don't rush and wish them away. They will come in their own sweet time (just like your amazing birthday sundae!) Before you know you will be looking back at the photos and the memories and wondering when you had changed from a little child into your own wonderful person. I look at this photo and I think I know the answer. It's right before my eyes. I love you my beautiful first born. You'll always be very special to me. A: I have no idea what it is? A caveman club? An oversized Cucumber/Zucchini/Courgette? B: Even if I knew what it was I have no idea what to do with it? So answers on a postcard please. What is it and a suitable recipe! The winner might just be invited around for tea! I have decided not to do a week by week update any-more as there was not a lot to say that haven't been said in previous updates. This week however is an exception as I reached a goal. This weekend I weighed in and I have lost a grand total of 5kgs! I am surprised at how easy it has been to get to this point. Yes, some weeks have been harder than others but it hasn't been like 8 solid weeks of dieting. There have been birthdays, girls nights out, coffee with friends and the odd glass of wine while vegging on the sofa. I've found a balance that I think I can maintain with my two strict days of reduced calorie intake and some exercise thrown in. This weekend brings with it family birthday celebrations, cake and laughter, wine and chocolates. I'm so happy to be able to join in knowing that I can balance the excess with discipline kicking in again on Monday and Tuesday. At this point I have to change my goals. It is no longer about seeing a particular number on the weighing scales. It is more about maintaining and improving fitness. A change in routine including a move towards pilates for toning rather than just peddling on the exercise bike to burn calories. I really am surprised at how much has been achieved in just two months. I still have 5 months until I turn 40 so there is no more big pressure to reach a goal. Hopefully I will use that time to make these lifestyle changes a concrete part of my ongoing future. Jamie Oliver, you are looking younger every day! Here is my kitchen counter top with a Jamie Oliver cook book propped up next to the oven. It looks a bit... different?! It took me a second look to work out why? Gareth's class were doing a craft activity in school that involved using photos of their faces and drawing the rest of the picture "What I like to do" There were some spare heads and one made its way home to our house. I'm not sure who thought it would be funny to stick it over poor Jamie's face but it has been giving everyone who sees it a laugh! ...for one day you'll look back and realize they were big things. On a slightly warmer note, I'm growing some windowsill herbs and the kids have been eagerly watching and waiting for the seeds to sprout. Finally some tiny Thyme seedlings have appeared and Rhiannon posted a photo of them on Instagram. I was quite impressed by her 12 year old photography skills and asked her to send me on the photo to blog it! What does a Welsh Man have for breakfast on St David's Day? Breakfast in bed of course! Happy St David's Day to my favourite Welsh man!